Since September 17th, a record 191 immigrant detainees being held indefinitely at the CECC have been on strike. Inmates are starving themselves, refusing to attend their hearings as well as refusing to go back to their cells. In response, a number of detainees have been placed in solitary confinement– euphemistically referred to as “segregation” by employees of the detention center. Monday’s press conference marked 48 days since the 191 migrants began strike actions in the maximum-security correctional center. One of the detainees, Michael Mvogo has even filed a complaint with the Working Group on Arbitrary Detentions at the UNHCR demanding an end to his indefinite detention. This strike follows last month’s federal prison strike where inmates were protesting the meager salaries received for their labour, a strike that has since been temporarily paused. Despite an alarming trend of prisoner strikes looming in Canada and a respectable amount of coverage in mainstream media, the situation in Lindsay remains relatively unknown to the Canadian public. 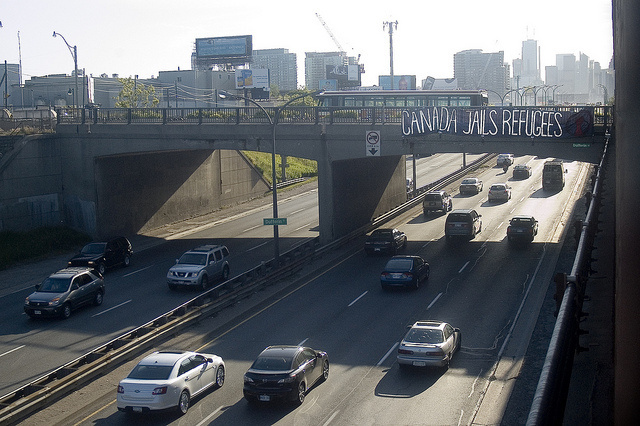 I can only guess us Canadians do not have an appetite for thinking too long about a) incarcerated people b) immigrants, and c) the population that lives at this social intersection because they are incarcerated immigrants. Canada is a country that prides itself on an ethos of “multiculturalism,” but the fact remains that we treat immigrants pretty terribly. According to the anti-immigrant detention group “No One Is Illegal,” between 2004 and 2011,82,000 people were locked up in immigration detention, with at least another 25,000 imprisoned since 2011. Canada spends around $54 million every year to lock immigrants up in detention facilities for noncriminal status offenses. Many of the people locked up in immigration detention are not there because they have committed a crime in the sense that we would typically think of (or if they have, they’ve already served their sentence prior to being detained in Lindsay), but because they are undocumented and in the country without having obtained status. What’s worse, Canada stands alone in the world when it comes to detaining immigrants on status offenses (e.g. being here without papers) indefinitely. Even the U.S. and the U.K. abides by an international legal standard that dictates immigrants either be deported or released within a presumptive period of around ninety days. The people detained indefinitely at Lindsay, while not citizens of Canada, cannot be deported home for any number of reasons. One of the major setbacks for detained immigrants can be not having travel documentation by their country of presumed citizenship. Canada can’t send these people away, yet it refuses to grant them the freedom to live as legal immigrants in the country. So they remain imprisoned in a bureaucratic limbo. The government’s solution is to spend millions of taxpayer dollars each year to keep these migrants, refugees, and stateless people locked up. With an apparent disregard for the UN’s standard on arbitrary detention, Canada can legally detain immigrants forever, if that’s our prerogative, and that’s disturbing power for our government to be wielding. In the case of the 191 detainees at Lindsay CECC, Ontario taxpayers are shelling out $239 a day, per inmate, to house these men, despite immigration falling under federal purview. Macdonald Scott, an immigration consultant for Carranza LLP who works with No One Is Illegal Toronto, explains that Canada operates on a two-tiered justice system: there are certain protections offered to citizens (the right to a fair and speedy trial, the right to counsel, etc.) that simply do not exist for people who aren’t citizens. At the press conference, John Greyson and Dr. Loubani were quick to point out that for all the outcry around their unjust detention as Canadian citizens in another part of the world, we were doing worse to people in our own backyard. Maximum security is no joke: immigrant detainees are not granted access to legal aid, must contend with a broken adjudication process, and are not allowed independent medical counsel either. This has proven especially dire for the detainees on hunger strike, as at least two of the detainees, Amin Mjasiri and Lynval Daley, have reportedly lost more than 40 pounds each since entering the center in Lindsay. When I asked about the conditions at Lindsay, Dr. Loubani had grim reflections to offer in the wake of his visit. “The visit conditions were worse than they were for us in Tora prison. I was fully not allowed to visit the other gentleman who I really wanted to visit. Amin is in solitary confinement—which we euphemistically call segregation—and all of [the inmates in] solitary were only allowed one visit. I was shocked and surprised. In Egypt, John and I were not placed in solitary despite the prison officials knowing full well we were striking. We were never denied a visit,” he said. According to Dr. Loubani, the conditions faced by immigrant detainees in Canada are in many ways similar to the conditions the pair faced while detained in Egypt. Detainees have no idea how long they will be detained with no hope for a hearing. Visitation was restricted to a single visitor for the entire solitary confinement wing. When Loubani asked about being allowed to visit, particularly given his recent experience and out of concern as a practicing physician, he was politely told no. “People were as accommodating as possible but they said the procedure doesn’t allow [for visitation]. I’ve heard this before. The procedure never allows. This is exactly what our jailers [at Tora prison] used to tell us. I sympathize with the jailers who are trying to do their job but what is happening to Mjasiri is unjust, unfair, and shouldn’t be happening at all,” he said. The stories told by the detainees at Lindsay were truly heartbreaking. Their stories are necessarily filtered through the voices of those standing in solidarity with them—family, community members, and activists. John Greyson told us he met with two detainees, both facing very dire circumstances. One was suffering from cancer, terrified of spending his last days in jail, and the other was being deported back to a country that he hasn’t lived in since he was nine years old. “He would be deported back to a place where he doesn’t speak the language, doesn’t know the culture. This deportation raises huge questions about what sort of due process he’s getting. The indefinite detention of all 191 raises a lot of questions, as Tarek has said, about what we’re doing as a nation,” said Greyson. The demands from concerned activists are by no means extraordinary. It was made clear that the striking migrants and the small, grassroots movement behind them, which now includes Dr. Tarek Loubani and John Greyson, are asking that the Canadian government adopt the international legal standard for arbitrary detention. This would mean the Canadian government would need to recognize a presumptive period of ninety days, at the end of which detainees must be deported or released. If passed, such a provision would put an end to the government’s tendency to keep people in jail who they cannot deport because they are refugees, or have no country to return to. I reached out to Public Safety Minister Steven Blaney’s office for comment on instituting a presumptive period of ninety days for arbitrary detention and around the migrant strike at Lindsay CECC. His compassion was palpable: “Canada has a fair and generous immigration system that allows in over 250,000 legal immigrants each year. We will not compromise the integrity of our immigration system. Those who seek to take advantage of our generosity will be removed,” Minister Blaney’s spokesperson said. To learn more and to keep up with the strike at Lindsay CECC, check out the End Immigration Detention Network.